Part 1: Republican candidate Donald Trump’s activities in Russia and compromising relationship with the Kremlin. This is the first part of a point-by-point review of the Russian dossier compiled by former MI6 agent, Cristopher Steele. The first memo marked, “Company Intelligence Report 80”, details how the Russians spent years building a relationship with Donald Trump, not because they thought he would be President one day, but from a standard procedure in Russian intelligence to win over foreign business leaders for their own benefit. The Russian authorities had been cultivating and supporting US Republican presidential candidate, Donald Trump, for at least 5 years. The reality, however, is that Trump couldn’t be more wrong. The President has deep Russian connections that far exceed what he admitted to Holt. In a 2007 deposition that Trump gave as part of his unsuccessful defamation lawsuit against reporter Timothy O’Brien, he describes efforts to launch real estate ventures in Russia through Bayrock Associates, a shady Russian-connected outfit. Bayrock had partnered with Trump on at least four major but failed American projects: the Fort Lauderdale Trump Tower, the Trump Ocean Club in Fort Lauderdale, the SoHo condominium-hotel in New York, and a resort in Phoenix. Bayrock had its office on the 24th floor of Trump Tower, and its 2007 glossy brochure featured a photo of Trump and Tevfik Arif, a principal Bayrock partner, who served for 17 years in the Soviet government before emigrating to the United States. It called the Trump Organization a “strategic partner,” and listed Trump as their primary reference. So it is very clear from Trump and his family’s own admission that most of their income is coming in from Russian investors. Okay so what. Why is this important? Penetrating leading foreign business corporations. Domestic monitoring of the elite. Attacking Russian political opponents, both at home and abroad. So Russian intelligence targeting every rich and powerful person who wishes to deal with Moscow and its oligarchs is just business as usual inside Russia. While there is no smoking gun document from Russian intelligence detailing exactly how and why they cultivated Donald Trump, from the Trump’s own admissions, his tendency to cover up his Russian ties, and what we know of how Russia intelligence works, this alone is more than enough reason to reasonably believe there is more than just coincidence here and to justify an investigation into the President’s business deals. The Kremlin had been feeding Trump and his team valuable intelligence on his opponents, including Democratic presidential candidate Hillary Clinton. The Kremlin had been feeding Trump and his team valuable intelligence on his opponents, including Democratic presidential candidate Hillary Clinton, for several years. This was confirmed by Source D, a close associate of Trump who had organized and managed his recent trips to Moscow, and who reported, also in June 2016, that this Russian intelligence had been “very helpful”. This was a bulls-eye for the dossier, and helped many in the media and intelligence community take a second look at it. Without a doubt, this detail in the dossier has been confirmed from the information contained in the guilty plea of George Papadaolous and the emails of Donald Trump Jr. When Donald Trump was pressed by the Washington Post to name who was advising him on foreign policy, he rattled off a list of five advisors who he claimed we all knew, Walid Phares, Carter Page, Joe Schmitz, ret. Lt. Gen. Keith Kellogg, and George Papadopoulos, but of course no one ever heard of most of these individuals. One of those advisors, George Papadaolous, was so new to foreign policy and had so little foreign policy experience he actually listed the Model U.N. on his LinkedIn page, and he was eager to impress. The short story is, George Papadapolous held several meetings and communications with a contact, “The Professor” who had deep contacts to Russian intelligence as well as someone in the Russian Ministry of Foreign Affairs, who was mentioned in the Dossier as being directly involved early on in the Trump-Russia operation. A few weeks after Clinton campaign chairman John Podesta’s emails were hacked by Russian intelligence, Papadapolous met with “The Professor” where he was offered “dirt” on Hillary Clinton in the form of thousands of hacked emails. Papadapolous then told Donald Trump directly that he had contacts with Russia who want to set up a meeting, which was later encouraged by the campaign, and that the Russians had the hacked emails of Hillary Clinton. A full timeline of the many contacts between Papadapolous and Russia can be viewed here. This is important because, it proves a direct link between the Trump campaign and the Kremlin. Donald Trump Jr., Paul Manafort, and Jared Kushner. The Dossier mentioned a meeting in June 2016, set up by a close associate of Trump who set up his other business deals in Moscow, where “very helpful” dirt on rival Hillary Clinton directly from Russian intelligence was delivered and shared. Want to know who had a meeting in June 2016 with the promise of “damaging” information on their political rival Hillary Clinton directly from Russian intelligence? And who were they meeting with? Natalia Veselnitskaya, a small town Russian lawyer who is now mysteriously crazy-wealthy. Rob Goldstone, a music producer and publicist who acted as middleman. Anatoli Samochornov, who by all accounts was just a translator. Rinat Akhmetshin, A lobbyist with ties to Russian intelligence. Irakly Kaveladze, a representative for Russian oligarch Aras Agalarov. The New York Times reported on records showing Natalia Veselnitskaya was directly coordinating her efforts with the Kremlin. She was delivering to this meeting talking points personally handed to her from Russia’s prosecutor general Yuri Y. Chaika, who has a long and storied background in kompromat. The memo she brought with her, which claimed a wealthy Democratic donor who gave money to Hillary Clinton was evading taxes, closely followed a document that Mr. Chaika’s office had given to an American congressman two months earlier, incorporating some paragraphs verbatim. Also, Kaveladze’s attendance is important because it confirms the other fact mentioned in the dossier, which is the meeting was set up by a close associate of Trump who had organized and managed his recent trips to Moscow… and that was Aras Agalarov. Aras Agalarov was mentioned in the emails to Donald Trump Jr. as the person wanting to set up the meeting on behalf of the “crown prosecutor of Moscow”, most likely referring to Yuri Y. Chaika. Agalarov was also the Putin-backed businessman who funded and partnered with Trump on the 2013 Miss Universe pageant, held in Moscow. Agalarov set up the travel, showed Trump around, introduced him to other Putin-backed oligarchs. Again, this meeting in June 2016 was directly reference in the Dossier. The Kremlin’s cultivation operation on Trump also had comprised offering him various lucrative real estate development business deals in Russia, especially in relation to the ongoing 2018 World Cup soccer tournament. 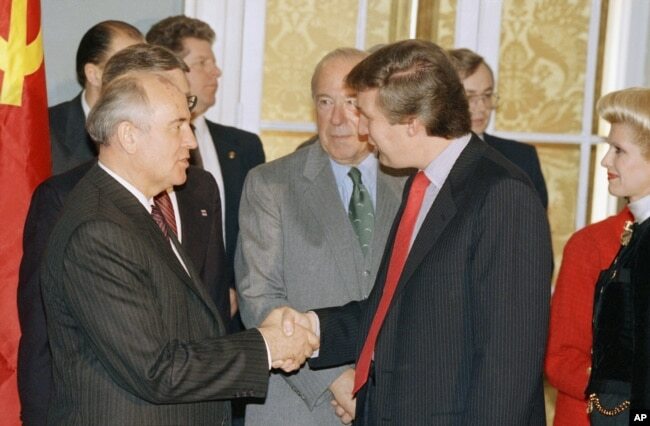 In 1997, Trump talked about plans for a Trump Tower in Moscow. From 2000 to 2010, multiple attempts to licensing his name to hotels in Russia. In 2007, Bayrock organized a potential deal in Moscow between Trump International Hotel and Russian investors. From 2006 to 2008 Trump’s company applied for a number of trademarks in Russia with the goal of real estate developments. In 2008, the Trump Organization announced plans to build residences and hotels in Moscow, St. Petersburg and Sochi, traveling to Russia 18 times. In 2013, Russian oligarchs wined and dined Trump in Las Vegas to convince him to let Moscow host the Miss Universe pageant. A few days later he tweetrd he hoped him and Putin would become friends. Also, we do know when the 2018 World Cup was being hosted in Moscow, one of the developers of luxury buildings for the World Cup is Aras Agalarov, the Putin-backed Russian oligarch who brokered the deal between Russian intelligence and Donald Trump Jr., who Agalarov promised potentially damaging information on Hillary Clinton from the Putin in order to help his father’s campaign in a July 2016 Trump Tower meeting. Agalarov, who is a friend of the family, would be in the perfect position to offer Trump a lucrative real estate development deal. But none of the projects panned out, so we will probably never know just how big of a carrot the Russians dangled out in front of Trump, or if the specific claim of the 2018 Word Cup was accurate, but we already know Russia offering Trump lucrative real estate deals is true. We have a signed letter of intent, during the 2016 presidential campaign, of Donald Trump and the Russian government agreeing to build Trump Tower Moscow, which would be the largest business deal the Trumps have ever done. This claim by the Dossier is 100% true. Exploited Trump’s personal obsessions and sexual perversions in order to obtain suitable ‘kompromat’ (compromising material) on him. According to the Mueller Report, Russian businessman Giorgi Rtskhiladze was in talks with Trump’s one-time “fixer” Michael Cohen about Trump Tower Moscow, well into the campaign, and during these conversations he told Cohen the pee tape existed and he was responsible for stopping its release. According to Source D, where s/he had been present, Trump’s (perverted) conduct in Moscow included hiring the presidential suite of the Ritz Cartlon Hotel, where he knew President and Mrs Obama (whom he hated) had stayed on one of their official trips to Russia, and defiling the bed where they had slept by employing a number of prostitutes to perform a ‘golden showers’ (urination) show in front of him. The hotel was known to be under FSB control with microphones and concealed cameras in all the main rooms to record anything they want to. We know that Trump hates Obama. Trump was the leader of the racist “birther” movement, slandered the former President many times, and has spent most of his energy erasing the gains made under Obama. We know then-President Barack Obama and his family stayed at the Ritz-Carlton in 2009 and slept in the presidential suite. And we know Trump was in Russia many times in 2013 for the Miss Universe pageant, and to meet with Aras Agalrov for a Trump Soho project. During this time, Trump was in the vicinity of the Ritz Carlton, having dinner at Nobu, which was in walking distance to the Ritz Carlton, as well as shooting a music video for Aras Agalarov’s son Emin inside the Moscow Ritz Carton in 2013. And finally we know his longtime bodyguard, Keith Schiller, told Congress after a business meeting before the Miss Universe Pageant in 2013, a Russian participant offered to “send five women” to Donald Trump’s hotel room in Moscow. We don’t know yet what hotel that was but Schiller testified that he stood outside Trump’s hotel room for a time and then went to bed, so he wasn’t with Trump the entire night. However, this is completely refuted by Kata Sarka, who was Miss Hungary during the 2013 pageant in Moscow. Sarka came forward months before we knew of the Dossier’s existence that during a pageant after-party Trump gave her his business card, private telephone number, and hotel room number. For proof, Sarka shared the business card with the media—which she kept, though she never went to Mr. Trump’s hotel room. And a Mother Jones article went into great detail on how Trump was convinced by Russian oligarchs to let Moscow host the 2013 Miss Universe pageant, which included taking him to a Las Vegas show where women dancers urinated on each other. All of a sudden, kompromat involving urinating prostitutes leans more probable. Another very telling sign that Russians have some sort of kompromat on Trump was when Putin was asked during the Helsinki summit in July 2018 if he has “compromising material” on Trump, he didn’t deny it. Let’s put this in context. Standing next to Donald Trump, where Trump was roundly criticized for being completely subservient to a Russian president, used Russian talking points, was combative with our NATO allies, all of a sudden cared about Montenegro, questioned NATO’s mutual defense, and thew American agencies under the bus, Vladimir Putin did not deny he had something on an American president. Instead Putin told a lie that he had no idea Trump was even in Moscow for his Miss America pageant in 2013. But oligarch and one of Putin’s best friends Aras A explained the Russian president sent a personal letter to Donald Trump with his apologies of not being able to attend the event as well as a gift of a traditional Russian box. This would be entirely possible as all intelligence agencies, including the CIA, compile dossiers on foreign dignitaries. Comprised mainly eavesdropped conversations of various sorts rather than details or evidence of unorthodox or embarrassing behavior. What is important to note is that there is no damaging or embarrassing information, just details on policies that appear to differ in private than in public. In other words, every politician ever in the history of politics. Donald Trump colluded with the Russian government in order to help elect him as President of the United States, engaged in quid-pro-quo to ease sanctions on Russia, and tried to cover it up.